Trieste Magica - Astonishment... at hand! In this page you will find a list of all the news, shows and appointments with the Magic of Trieste Magica. All events are listed by date and most recent things are in an upper position. You can see some photos in "About us" in the section Photo Shots. Go here to have a look at our old news. 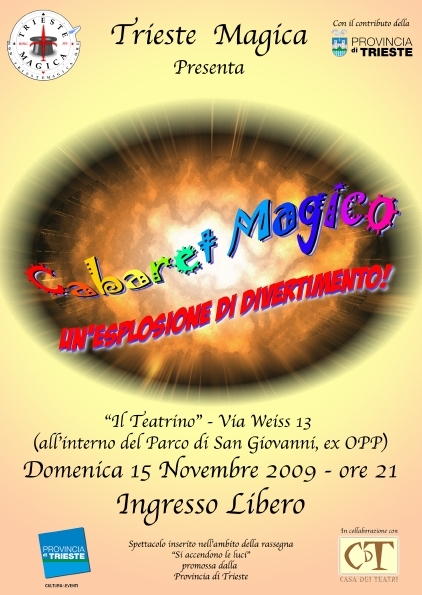 NEXT 07/03/2010 Trieste Magica, is presenting again the show "Cabaret Magico". Seventy-five minutes made from a perfect mix between Magic and comedy. The show, which is part of the "1a rassegna di Primavera: Magia, Emozioni, Equivoci" lineup realized by "TeatroIncontro". The show is made possible thanks to the co-operation with "Casa dei Teatri" and the contribution of the association "FITA-UILT FVG". The performance will take place at the "Teatro del Centro Giovanile" in Via Moreri 22, Trieste. Free admittance until the theatre fills up. The show starts at 18. You can have a look at the playbill here. 02/11/2010 Trieste Magica did a show for the "Fat Thursday Carnival Party" at the Abdus Salam International Center for Theorethical Physics (Trieste). The show was completely performed in english for an all-scientist audience coming from all-over the world attending the ICTP winter college. 19/12/2009 Trieste Magica is invited to the "Friuli" Shopping Mall, in Via Nazionale 127 at Tavagnacco (UD), with a stand of Stage Magic. Baloon sculptures started in the morning followed by many show throughout the entire day. 12/13/2009 Trieste Magica is proud to present the children show "Magic Academy". The show, that the last september registered a full theatre, is made possible thanks to the contribution of the "Provincia di Trieste" and in cohoperation with "Casa dei Teatri". The show will take place at "Il Teatrino", via Weiss 13 (inside the San Giovanni Park, where the Old Asylum used to stand). Free admittance until the theatre fills up. The show will start at 5 PM. You can give a look at the playbill here. 11/15/2009 Trieste Magica is proud to present the new show "Cabaret Magico". Ninety minutes made from a perfect mix between Magic and comedy. The show, which is part of the "Si accendono le luci" lineup, is made possible thanks to the contribution of the "Provincia di Trieste" and in cohoperation with "Casa dei Teatri". Free admittance until the theatre fills up. The show will start at 9 PM. You can give a look at the playbill here. 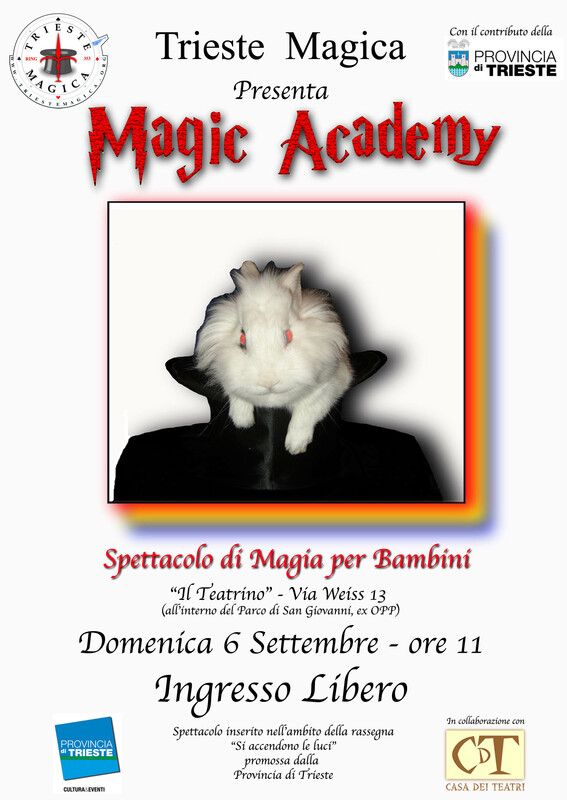 09/06/2009 Trieste Magica is proud to present the new children show "Magic Academy". Free admittance until the theatre fills up. The show will start at 11 AM. 08/21/2009 Trieste Magica waits for you at "Enchantments... under the stars", The new show for Porto San Rocco with a showcase of some of our best artists. An evening you will not forget! The show will take place at the Porto San Rocco Convention Center (Strada per Lazzaretto 2, Muggia) , starting at 9 PM. Free admittance until the room fills up. 06/30/2009 Trieste Magica will present the eighth edition of the show "Soirée Fantastique", at the San Marco Cafe, via Battisti 18, Trieste. The show, mainly aimed at close-up magic, will start at 9:00 PM. Free admittance. 03/22/2009 Many balloons and close up-magic for the "Friuli" Shopping Mall (Via Nazionale 127, Tavagnacco, near Udine), Birthday! Balloon sculptures started in the morning and ended at 7PM, whereas Five of our Artists did a 4 hours no-stop of close up magic.